So what do the experts in the field say? Here are a few Industry Analysts who collect their definitions from discussions with many cloud company CEOs, CIOs, and the like. Cloud Computing: A style of computing where scalable and elastic IT-enabled capabilities are delivered as a service to external customers using Internet technologies. 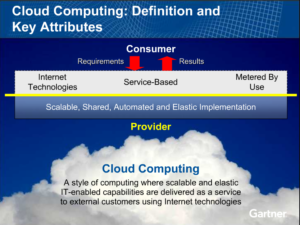 Gartner provides their in-depth view of cloud here. Frank details his definition a bit more here….and I can’t help but love the detailed data IDC provides on Cloud Service Revenue forecasts here. A standardized IT capability (services, software, or infrastructure) delivered via Internet technologies in a pay-per-use, self-service way. You can find much more on their blog here. As some may recall, Forrester acquired Jupiter Research in late 2008. ‘Cloud computing’ describes a service model that combines a general organizing principle for IT delivery, infrastructure components, an architectural approach and an economic model – basically, a confluence of grid computing, virtualization, utility computing, hosting and software as a service (SaaS). Or, put more simply, the cloud is IT, presented as a service to the user, delivered by virtualized resources that are independent of location. You can see more about 451’s cloud perspective on their blog here. Cloud computing is the next-generation of software as a service, in which a complete software environment is licensed as a subscription from a software vendor and low-cost, secure, and dependable IT hardware infrastructure is ‘rented’ from a utility-computing provider on demand. The customer has complete control over its own secure and private IT environment at a very low cost and without the hassle of procuring and managing its own data center. It can quickly scale IT resources up or down as computing needs change. And [the customer] has complete freedom to customize the solution as it sees fit and complete control over upgrade cycles and all other aspects of its IT environment. More about cloud from AMR here. The set of disciplines, technologies, and business models used to render IT capabilities as on-demand services. You can read more from Jamie Lewis, Drue Reeves and others on their blog here. A set of web-based tools and services which permit users to acquire computing resources and development capabilities to build or support applications, or perform specific IT functions on a pay-as-you-go basis. Cloud Computing is a model of technology provision where capacity on remotely hosted, managed computing platforms, on which applications can be developed and/or deployed, is made publicly available and rented to multiple customers on a self-service basis. Cloud Computing resource capacity is provided through a “utility” model – it’s licensed and paid for based on consumption, rather than being purchased in perpetuity through a traditional technology licensing model. In addition, a Cloud Computing provider isn’t only responsible for delivering functionality; it’s also responsible for providing customers with agreed levels of service (performance, reliability, scalability, availability and security and so forth). ‘Cloud computing’ is nothing more than a service model where business workloads are deployed, transparently executed internally or somewhere on the Internet, and businesses only pay for what they consume. Rather than purchase servers, storage, and other pieces of IT equipment, businesses simply purchase a set of dials and indicators that finely-tune and adjust IT performance, availability, data protection, and security based on business requirements regardless of the actual physical location of the applications and data. Although it is difficult to come up with a precise and comprehensive definition of cloud computing, at the heart of it is the idea that applications run somewhere on the “cloud” (whether an internal corporate network or the public Internet) – we don’t know or care where. Self-healing: In case of failure, there will be a hot backup instance of the application ready to take over without disruption (known as failover). It also means that when I set a policy that says everything should always have a backup, when such a fail occurs and my backup becomes the primary, the system launches a new backup, maintaining my reliability policies. SLA-driven: The system is dynamically managed by service-level agreements that define policies such as how quickly responses to requests need to be delivered. If the system is experiencing peaks in load, it will create additional instances of the application on more servers in order to comply with the committed service levels — even at the expense of a low-priority application. Multi-tenancy: The system is built in a way that allows several customers to share infrastructure, without the customers being aware of it and without compromising the privacy and security of each customer’s data. Service-oriented: The system allows composing applications out of discrete services that are loosely coupled (independent of each other). Changes to or failure of one service will not disrupt other services. It also means I can re-use services. Virtualized: Applications are decoupled from the underlying hardware. Multiple applications can run on one computer (virtualization a la VMWare) or multiple computers can be used to run one application (grid computing). Linearly Scalable: Perhaps the biggest challenge. The system will be predictable and efficient in growing the application. If one server can process 1,000 transactions per second, two servers should be able to process 2,000 transactions per second, and so forth. Data, Data, Data: The key to many of these aspects is management of the data: its distribution, partitioning, security and synchronization. New technologies, such as Amazon’s SimpleDB, are part of the answer, not large-scale relational databases. And don’t let the name fool you. As my colleague Nati Shalom rightfully proclaims, SimpleDB is not really a database. Another approach that is gaining momentum is in-memory data grids. More about cloud from GigaOM here. Cloud computing…is about the evolution of dynamic virtualised infrastructure that allows us to think more in terms of resource pools than individual IT components. This in turn opens the door to delivering computing resource on a utility basis, which is equally applicable both internally (i.e. with regard to the way you use your data centre) and externally – which takes you into the realm of utility computing and software as a service. You find more on Cloud and IT from Freeform here. Michael Monk doesn’t really define cloud. He starts out acknowledging that a definition is needed, but then continues to elaborate here. Before cloud computing was all the rage, if you recall, we were all nuts about Software-as-a-Service, one of the funner tech initializations – “SaaS”! Once Amazon introduced EC2, SalesForce Force.com, and others followed, we needed some more categorization to differentiate and understand these things. “We” being industry pundits & vendors. Thus, we arrive at the 3 *aaS’s of cloud computing. SaaS depends on PaaS, depends on IaaS. The wider world probably cares more about actually doing something – SaaS – than having middleware to build something – PaaS – and care more about those two things than having a bunch of instances with that annoyingly calm blinking command like cursor – IaaS. More from Michael about cloud can be found here. Cloud computing is the next stage in the evolution of the Internet. The cloud in cloud computing provides the means through which everything — from computing power to computing infrastructure, applications, business process to personal collaboration — can be delivered to you as a service wherever and whenever you need. The cloud has several key characteristics: elasticity and scalability, self-service provisioning, standardized APIs, billing and metering of services, performance monitoring and measuring, and security. There are three models for Cloud: Infrastructure as a Service, Platform as a Service, and Software as a service. David Mitchell, John Maden and Laurent Lachal are quoted quite a bit on cloud. But unless you’re a paying customer, the Ovum/Datamonitor/Butler Group isn’t as forthright with online disclosures/opinions let alone definitions as some of the other analyst groups. John Burke and Andreas Antonopoulos at Nemertes frequently comment on IT in their blogs here and here respectively. The analysts over at ABI have decided to stick to their core, that being mobile. In their report, mobile cloud computing, Mark Beccue and others highlight that mobile cloud applications move the computing power and data storage away from mobile phones and into the cloud, bringing apps and mobile computing to not just smartphone users but a much broader range of mobile subscribers. Frost & Sullivan research and report on Cloud Computing as seen here. However, the IT research team is generally very tight lipped with their research….unless you are a paying customer. They don’t seem to actively promote their perspective in cloud within their IT research services. Cloud computing is Internet- (“cloud-“) based development and use of computer technology (“computing”). In concept, it is a paradigm shift whereby details are abstracted from the users who no longer need knowledge of, expertise in, or control over the technology infrastructure “in the cloud” that supports them. It typically involves the provision of dynamically scalable and often virtualised resources as a service over the Internet. Had enough yet? I’m sure we could poll a few CEOs of cloud service/product providers as well as a few CIOs of cloud technology users…but I suspect their defintions are similar. Did I miss you? 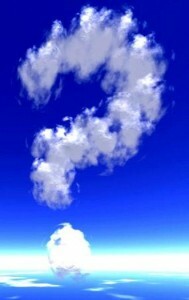 Please comment on your analyst group and cloud definition. I like the RedHat whitepaper written by Gordon Haff called Cloud 101. It provides a nice overview of the cloud delivery models including Private, Public, and Hybrid and the various architectures of cloud including IaaS, PaaS, and SaaS. Tagged with ABI Research, AMR Research, Burton Group, Cloud, cloud, cloud services, Enterprise Strategy Group, Forrester, Freeform Dynamics, Frost & Sullivan, Gartner Group, GigaOM, IDC, Jupiter Research, MWD Advisors, Nemertes Research, Ovum, RedMonk, SaaS, software as a service, The 451 Group, THINKstrategies, Yankee Group. Here is another definition for you. I am one of the authors of the newly published Cloud Computing for Dummies (published by WIley).